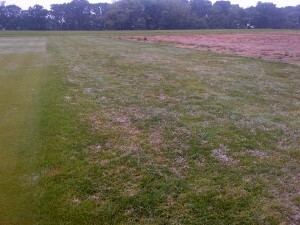 The high humidity of last night (28-29 May) caused dollar spot disease to escalate. 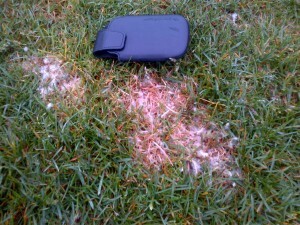 Until last night, symptoms on unprotected susceptible turf were minor. The cottony fungal growth (mycelia) of dollar spot, which is easily seen at early morning hours during wet humid weather. Susceptible grasses grown under low N fertility will typically have the greatest damage from dollar spot. Annual bluegrass (Poa annua) is highly susceptible to dollar spot disease. In fact, you will often see annual bluegrass as the grass species with the most dollar spot damage in a mixed stand of grasses. Some varieties of creeping bentgrass have better tolerance to this disease and should be considered when selecting a variety. Colonial bentgrass is generally more tolerant of dollar spot than creeping bentgrass, although differences among colonial bentgrass can also be seen. The variety, Capri, had less disease this morning compared to older colonial bentgrass varieties. This morning dollar spot mycelia was so profuse on this low maintenance turf that it looked like frost. Perennial ryegrass is another species that will often be infected by dollar spot before other grasses, especially when is managed with low N fertility. Kentucky bluegrass can also be affected by dollar spot but many varieties have good tolerance to the disease.